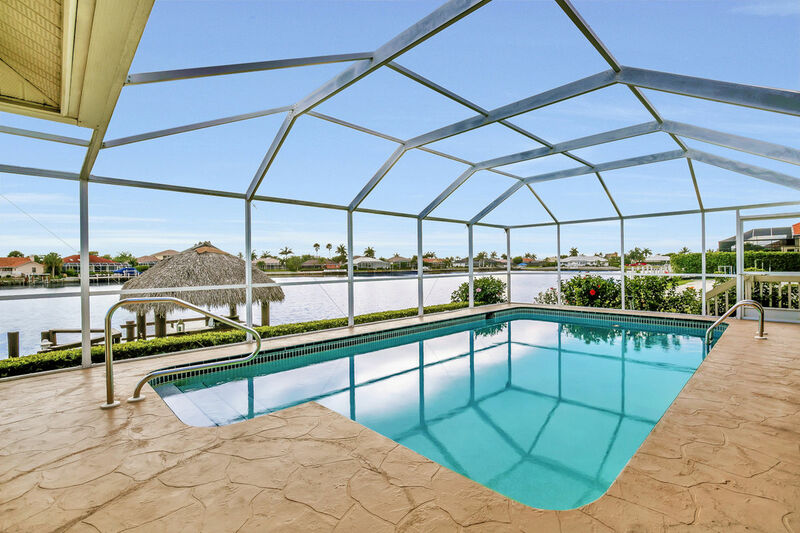 The warm tropical setting makes this a great place to escape for you next vacation. 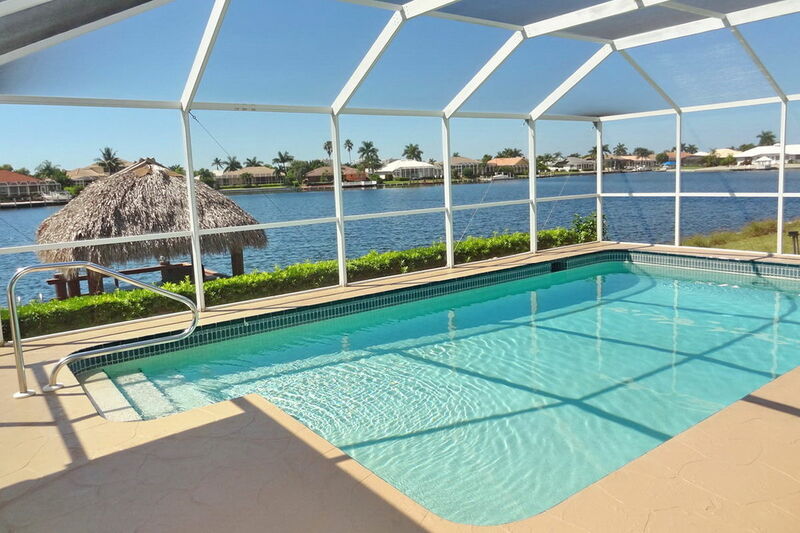 This beautiful 4 bedroom 2 bath house offers a magnificent water view. 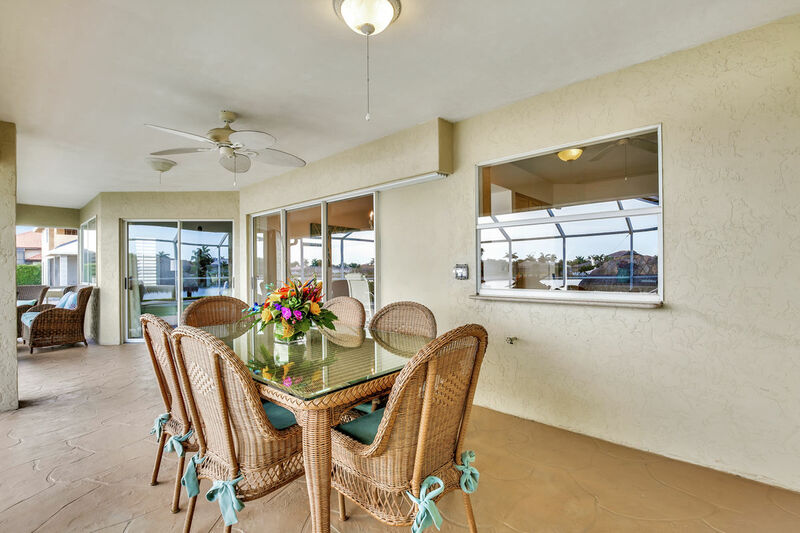 Relax on the spacious lanai/pool , enjoy a BBQ by the Tiki Bar or under the covered lanai with plenty of seating. 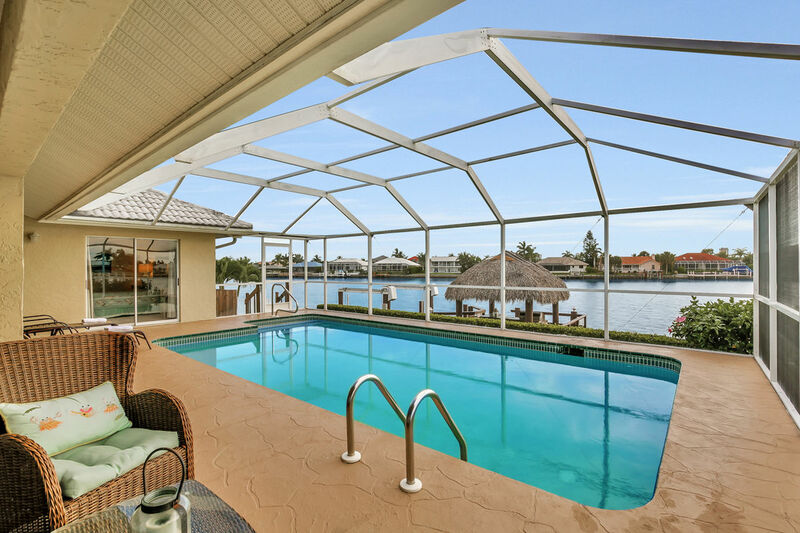 What a great place to entertain and loutdoor living. 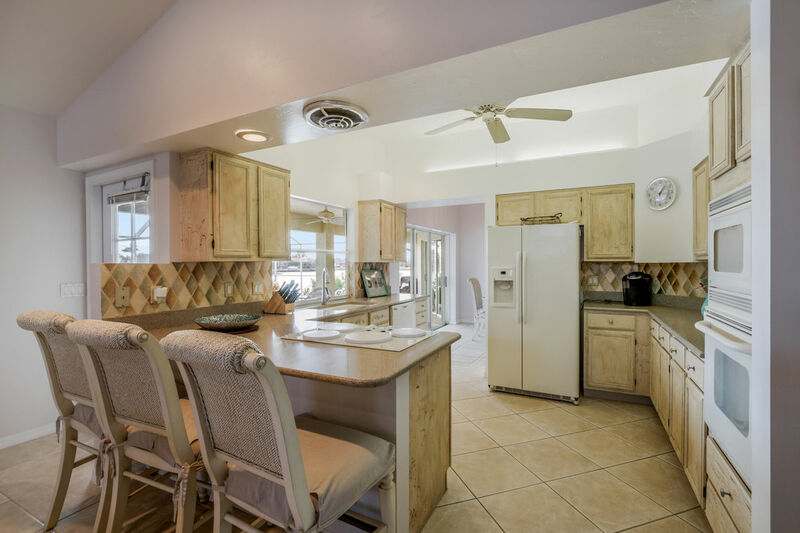 The home has a western exposure which give’s plenty of sunshine an amazing sunsets! 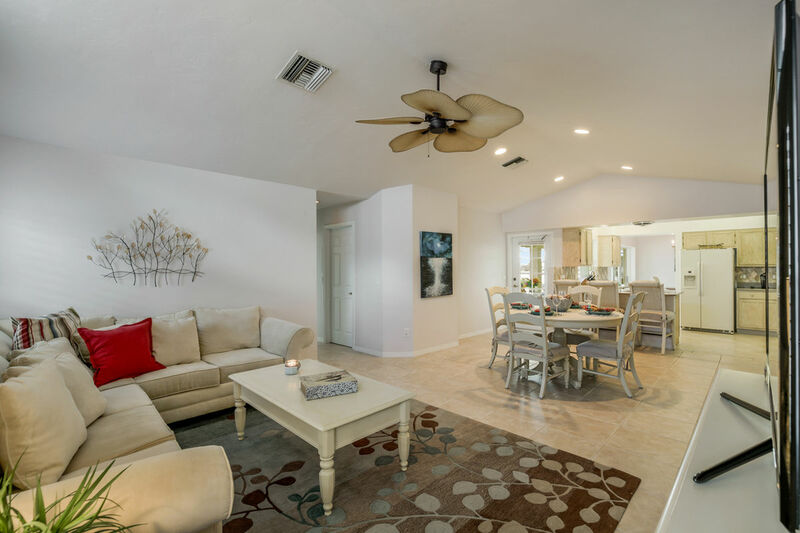 Large home offering you spacious rooms, open floor plan and many places to gather with friends and family. 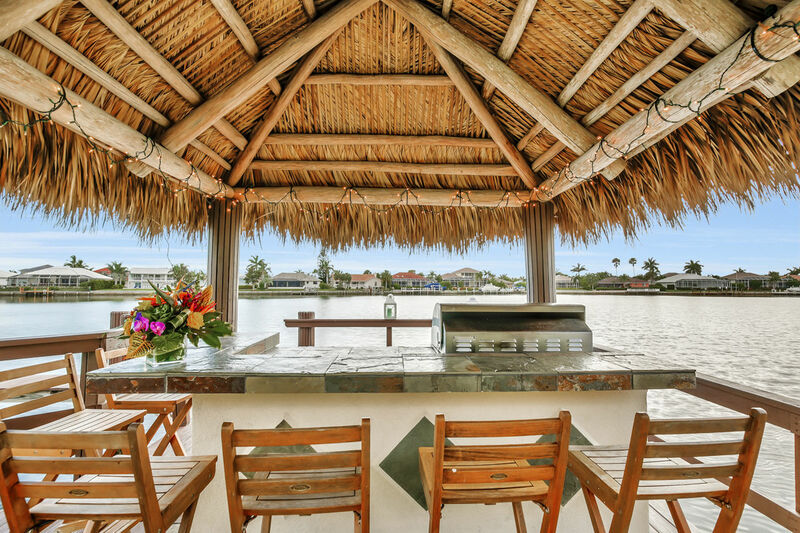 Tiki Bar is an additional special feature and one of the kind to sit by the water and watch the most amazing sunsets. Dock available upon request. 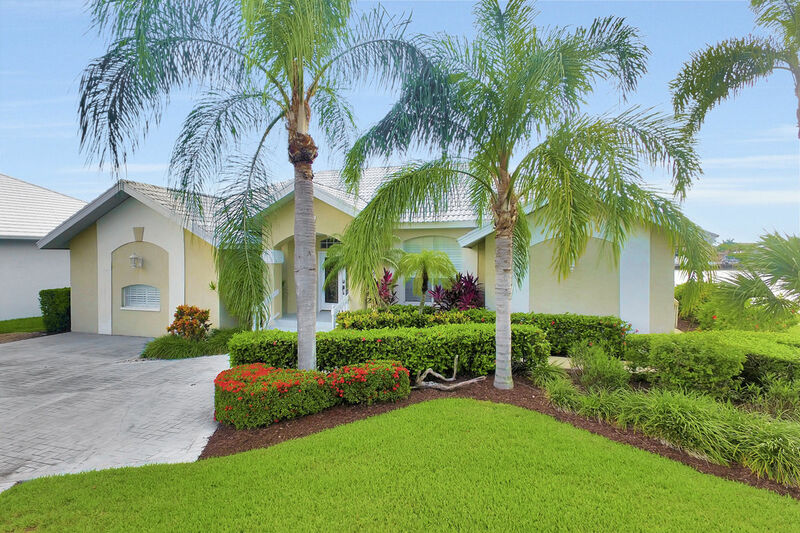 This home has everything you need to plan your vacation in Paradise Marco Island. 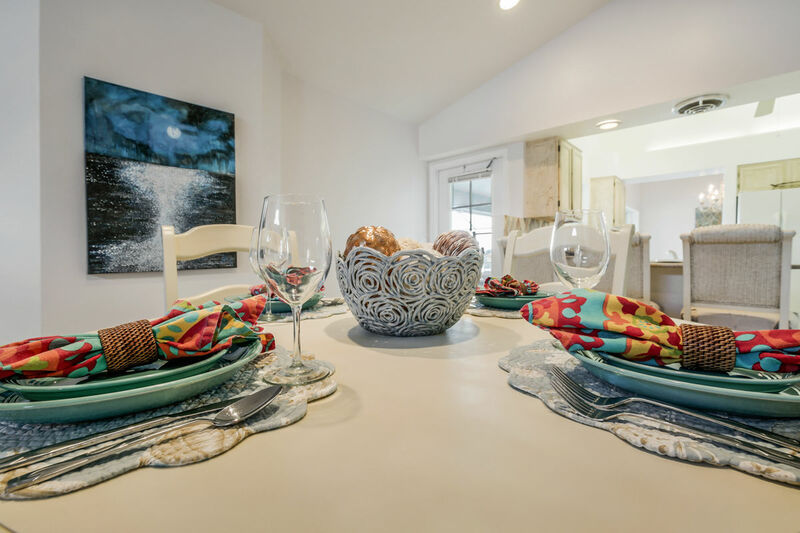 Formal and casual dining areas, breakfast bar, fully equipped kitchen if you like to cook and entertain and pass through available from kitchen to outdoor seating. 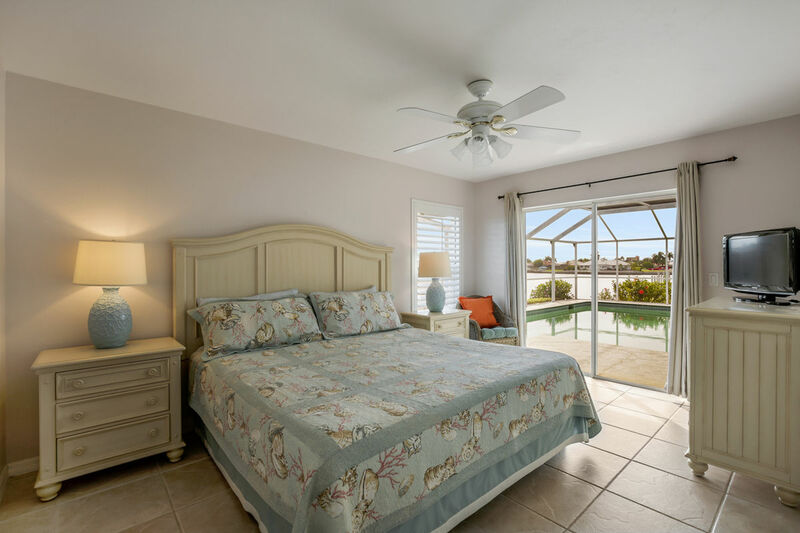 The master bedroom has a luxurious wooden four post king size bed and opens to the lanai with a fantastic water view. 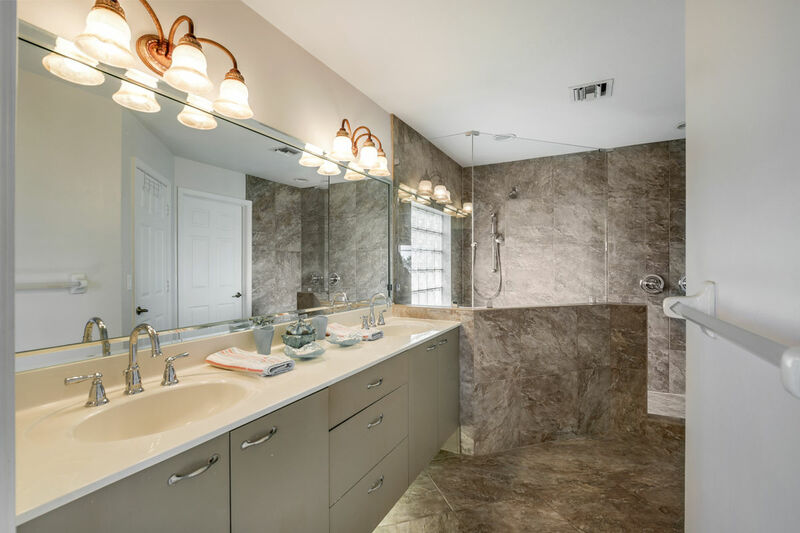 The master bathroom features a dual sink and a spacious shower that is suited for royalty. The tile work is amazing. 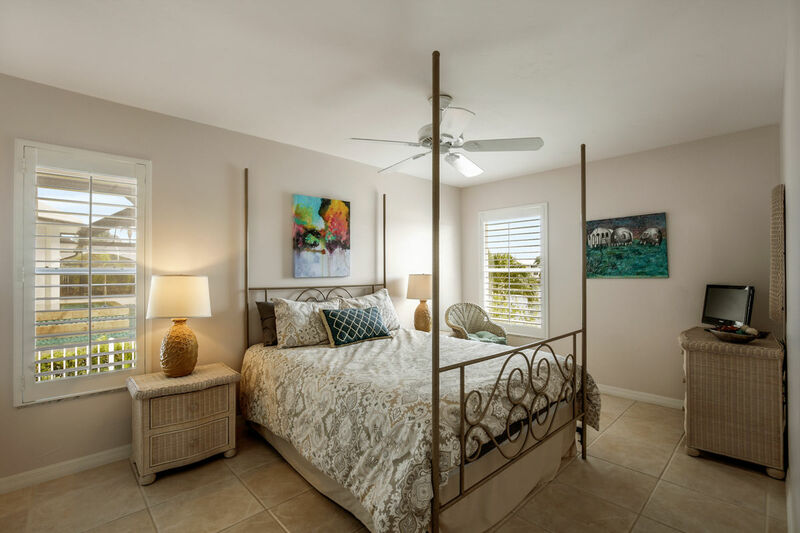 The 2 bedrooms are both equipped with inviting queen size beds. 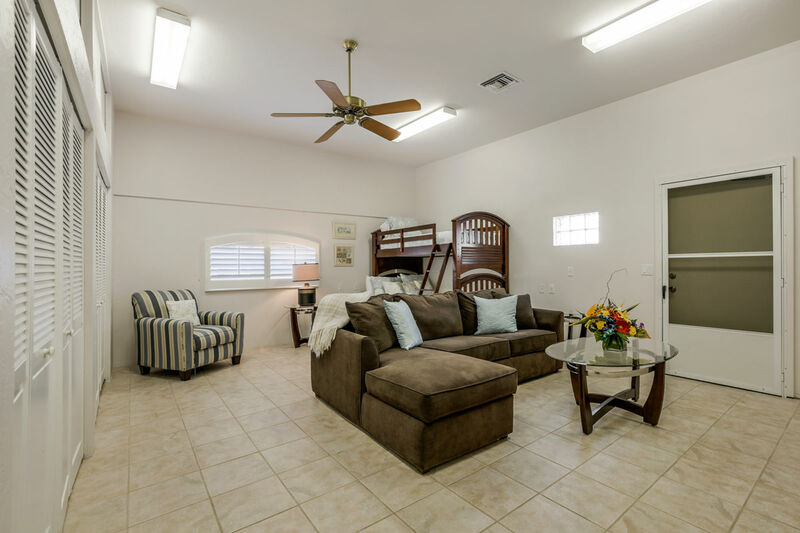 One is has a poster bed and the other one has a door opening to the lanai. 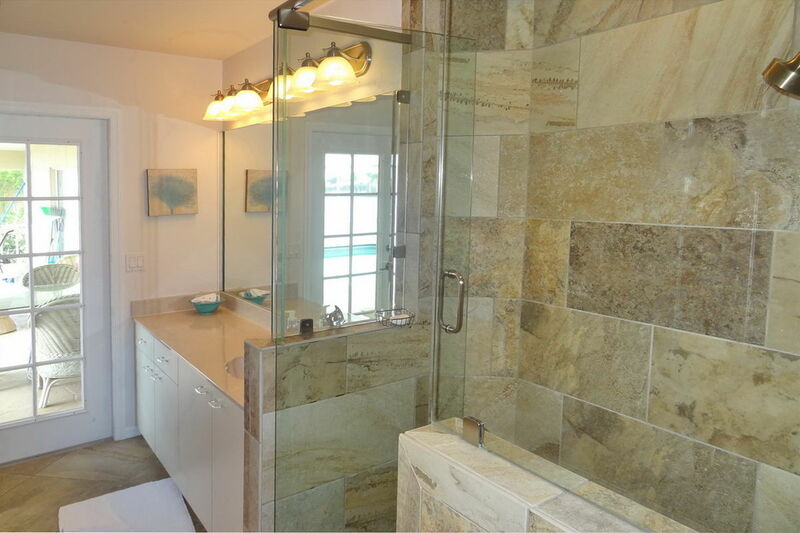 They share a gorgeously tiled full bath that leads out to the lanai. 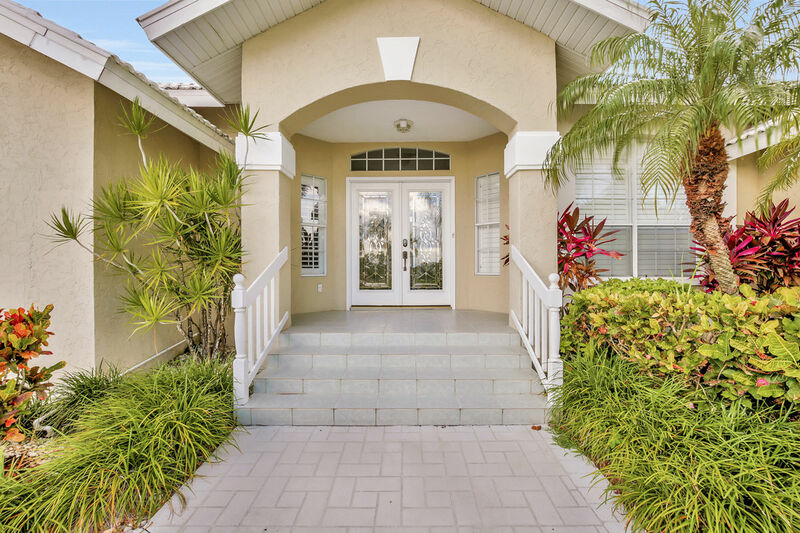 This home is conveniently located to fine shopping and some of the best restaurants in Marco Island. The beaches are just a short drive away. Tigertail Beach is one of two public access beaches and is a short drive from your vacation home. Tigertail Beach offers you the Lagoon as a great place for families with younger kids to enjoy the flat and calm water. There is plenty of wildlife to view and is a designated ‘Great Florida Birding Trail. To reach the Gulf of Mexico with the beautiful soft sandy beach you either have to wade through the lagoon or walk around the to the left. It’s definitely worth the ten minute stroll. The beach here is absolutely breathtaking and totally natural. And don’t forget your shelling bags. 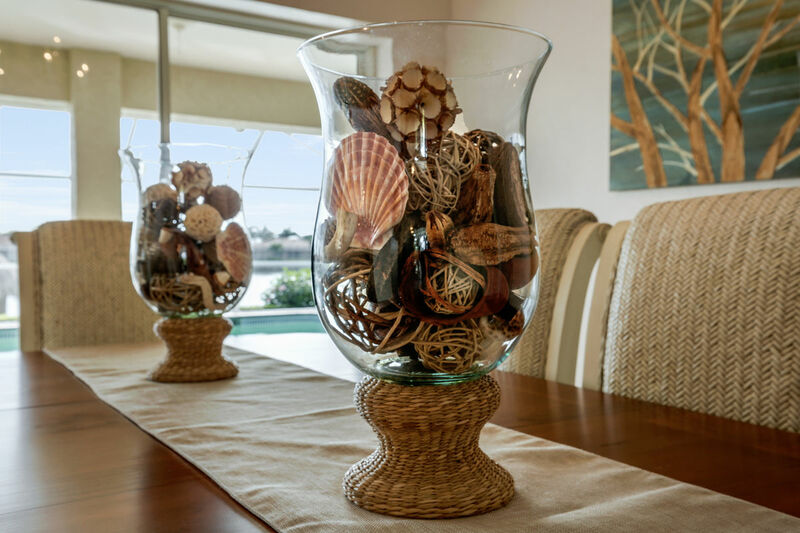 The beach offers you beautiful shelling. It is open 8 a.m. to sundown and there is a fee for parking. 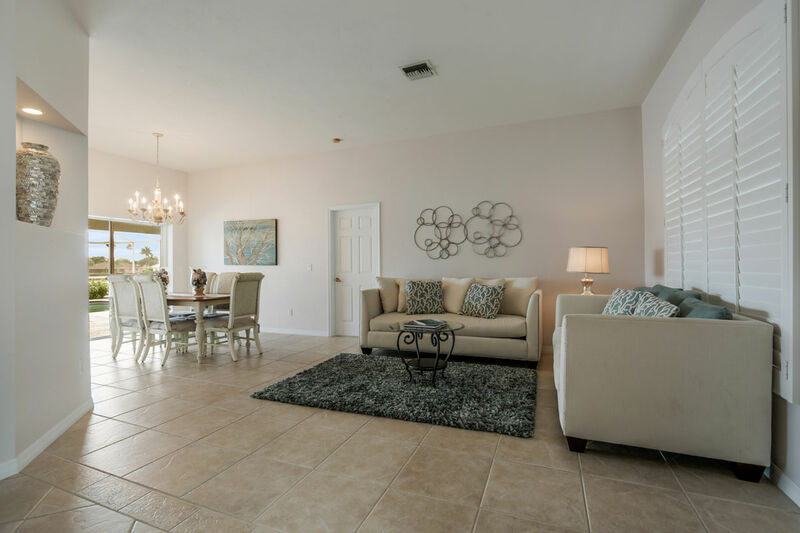 First time on Marco Island, we spent an extended weekend at this vacation home. Very spacious inside. Interior is light and modern exactly as shown on the pictures. 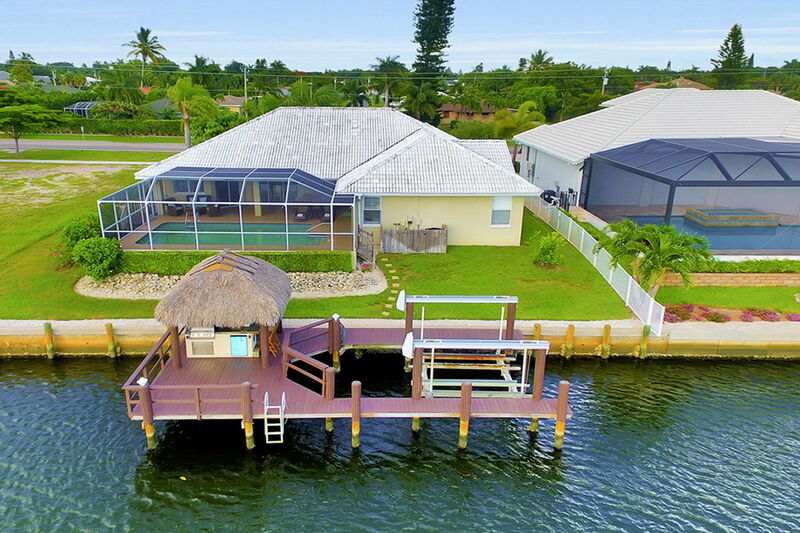 The highlight is the tiki hut on the water. 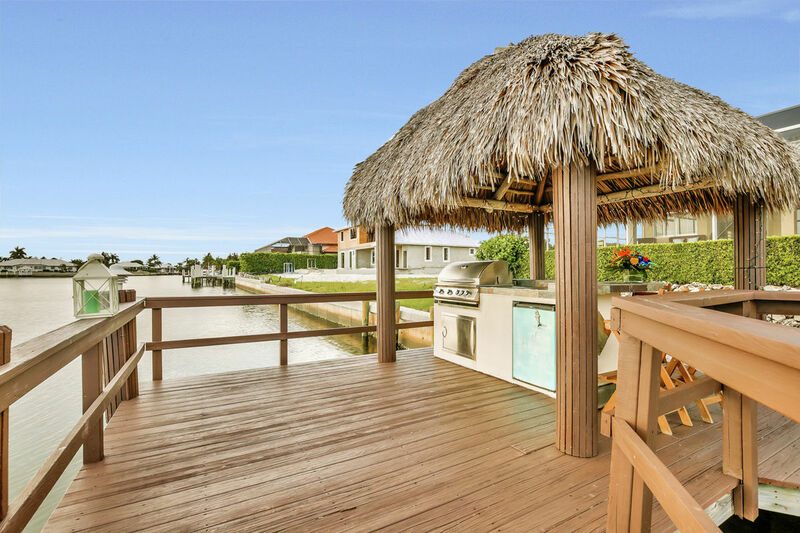 Extremely few homes on Marco seem to have this and it is a huge plus. 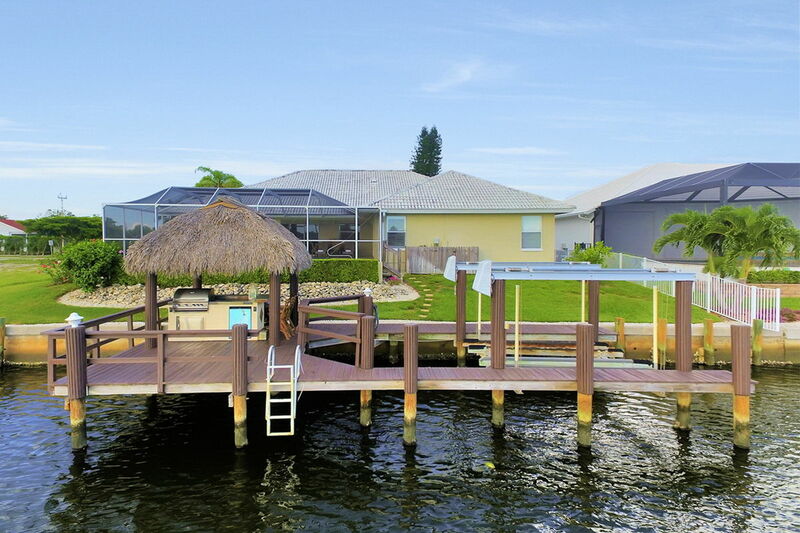 You can grill, have drinks, read, and fish there at any time of the day as there is shadow and a comfortable breeze. The channel is actually much wider at this spot than usual. On the first night, we had drinks at the hut and got a visit from two dolphins. 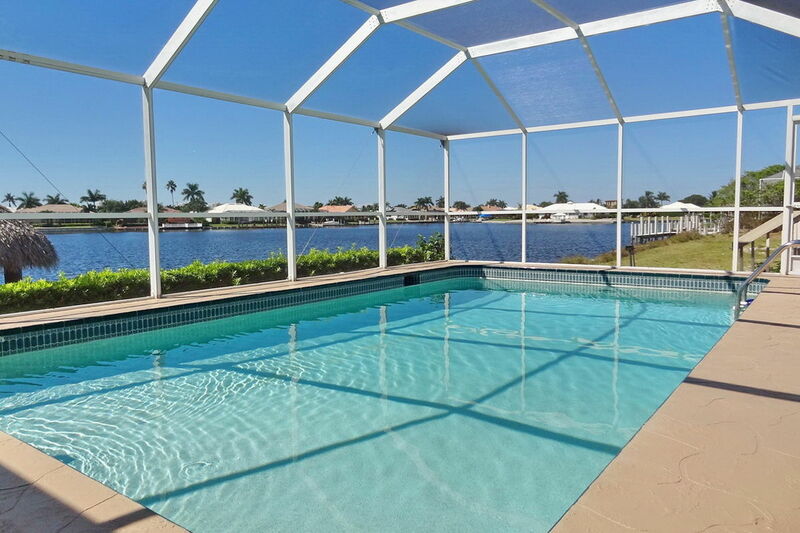 The home and pool are in top condition. 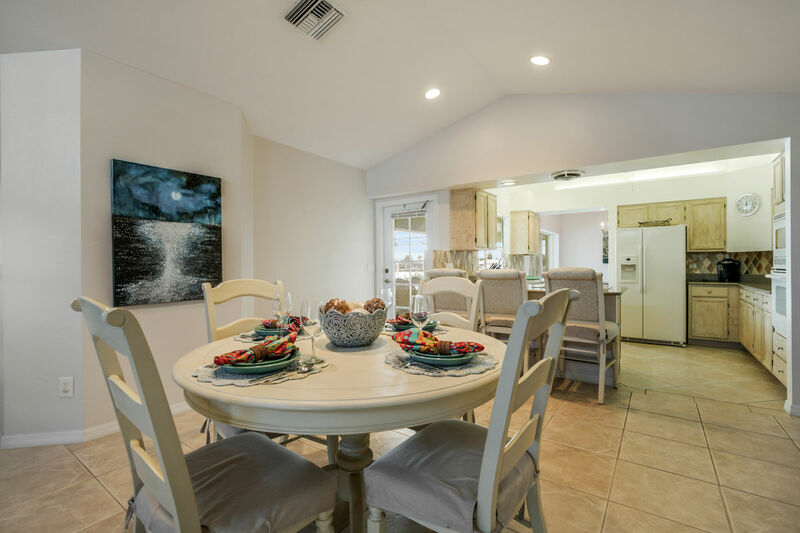 Beach, shopping, and excellent restaurants are within 5 minutes by car or a 10 minute bike ride. The house already has three bikes that come with it (along with a selection of beach toys, a fishing rod, and so on) and if you need more there are rentals nearby. A great public golf course is about 20 minutes away (along with several others we didn't have time to try out). Overall a great experience. The house itself has a warm feeling, is bright, clean, and comfortable. 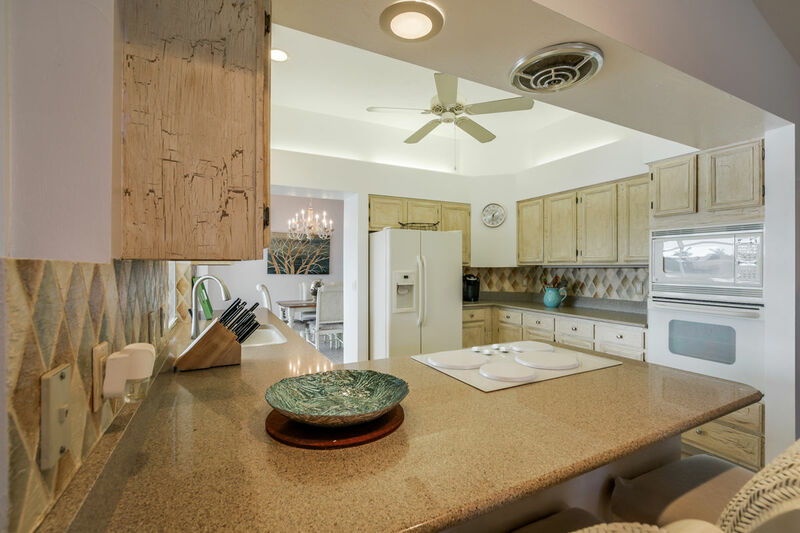 The rooms are tastefully furnished, and even the kitchen is well stocked. 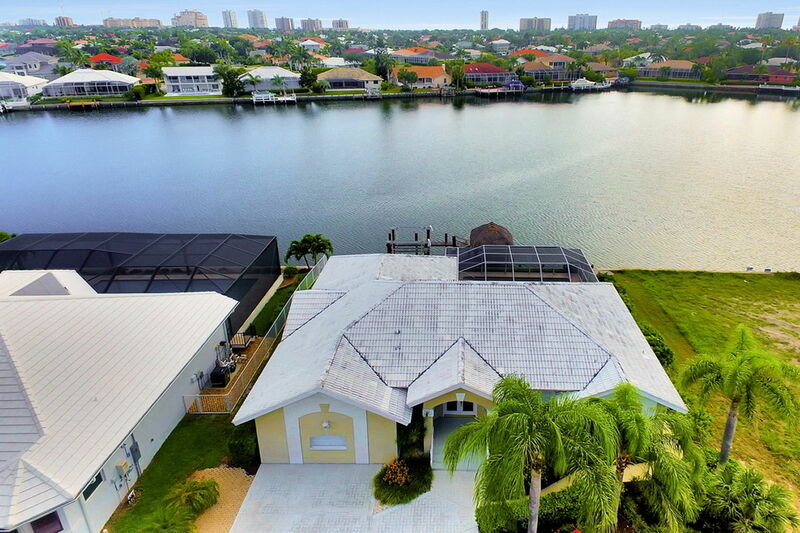 It is situated right along the channel allowing for direct access to water. 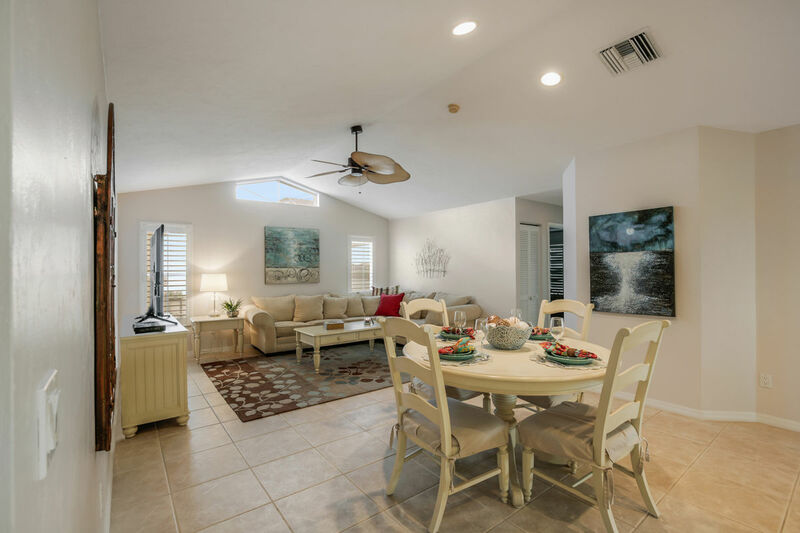 Only a few minutes away from the beach or town center. One of most memorable features was the tiki hut/grill area which was the perfect place to sit and watch the sun set over the channel in the evenings. I would definitely recommend this house! 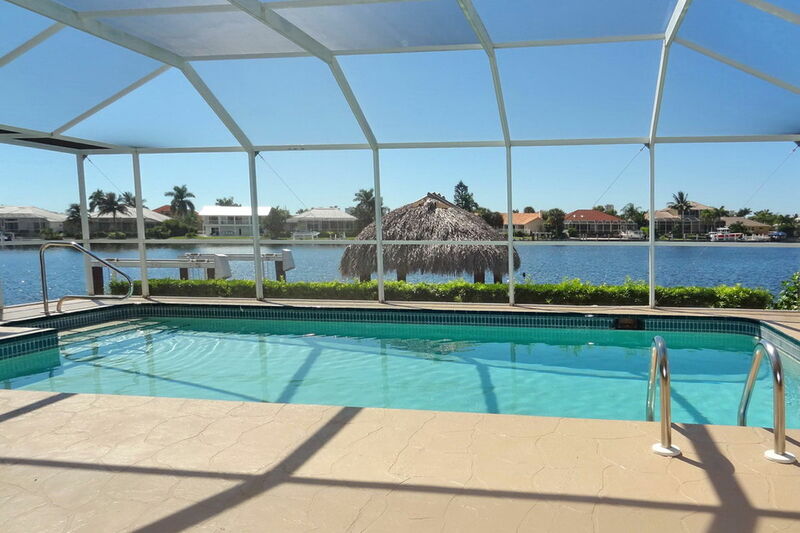 We spent 12 days at this beautiful house on Marco Island, end of november 2014. To move freely. The condition equipment of the rooms was also impressive. We were also particularly impressed by the condition at the channel in view of the sunset. A highlight was the grill area with the natural roofed-over construction next to the water. Here we were able to spend great evenings with delicious steaks and a glas of wine. Rented this house for a week of pure bliss! Enjoyed everything about it including visits from dolphins at the tiki bar!! Enough space for 5 adults, my 2 and 5 year old grandchildren had a blast! The only bad part was making a left hand turn out of the drive-way onto a busy street, other than that pure perfection! Words or pictures will not do this home justice. It is more beautiful than I can describe. We have stayed at many places on vacations and this home is by far the best place we have stayed. 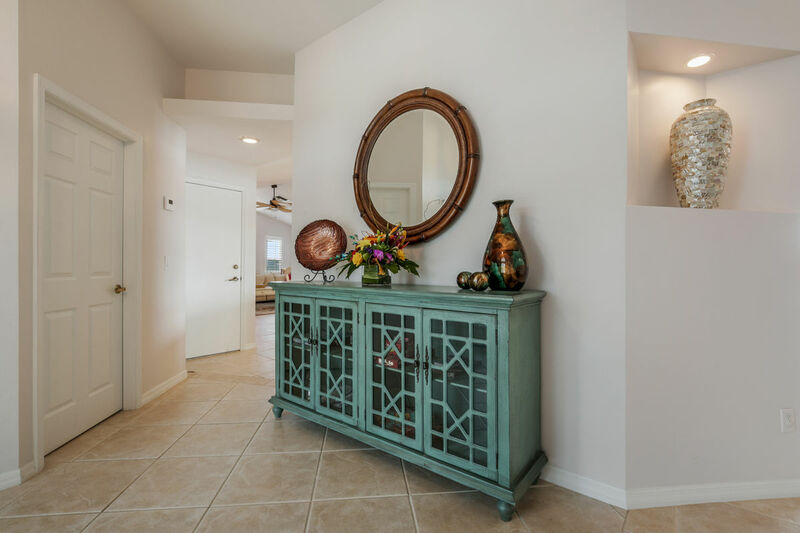 Anything you can think of you may need is included in this home. The views of the bay are just gorgeous. One morning during our stay we had a dolphin swim by our dock. We didn't want to leave. 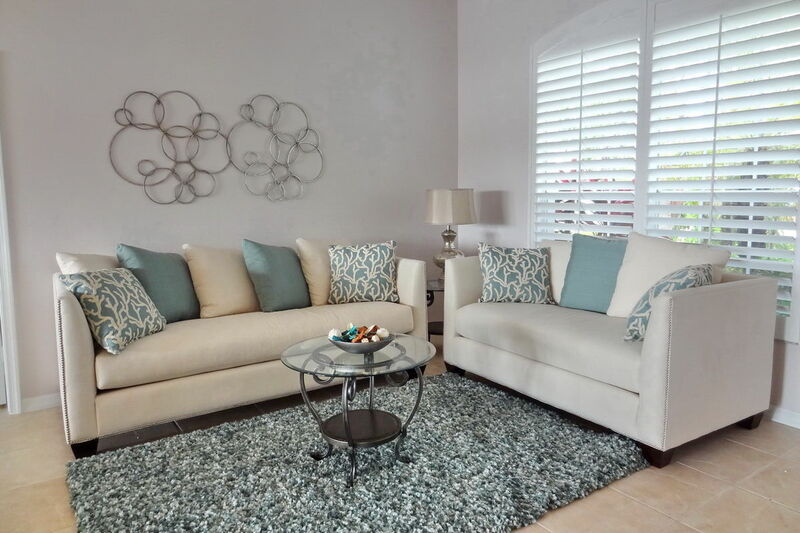 You can completely just stay at this home and relax, or visit all the fun things to do on the island. We stayed just one week, I wish we could have stayed two weeks! Beautiful house with pool and water viewed. Tiki bar was awesome! Perfect to hang out with friends and have some cold drinks. 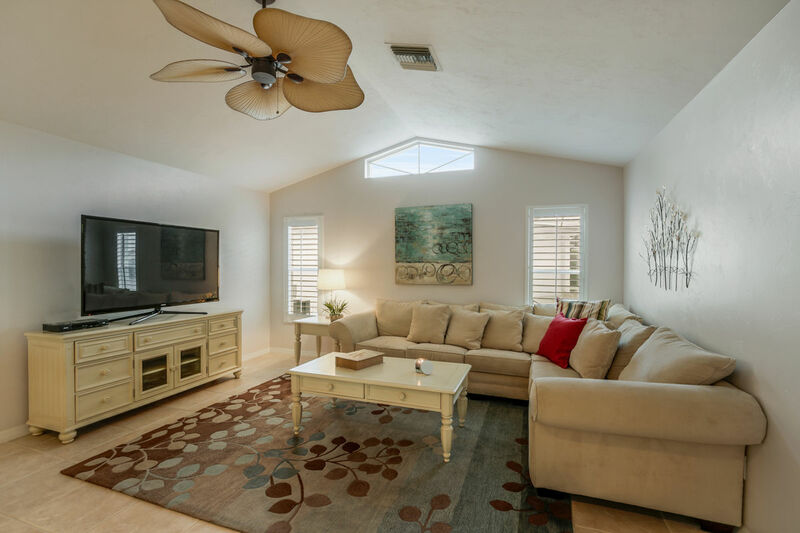 Very spacious house with updated bathrooms and comfortable bedrooms. Guest bedroom even had water views. Close to shopping and restaurants. Highly recommend it. Definitely coming back to this well-kept & comfortable home. I commend the convenient location, great sunsets and that Tiki Hut was truly something special. The grilling location was great, the free bicycle rentals seemed quite new. Thanks for a great stay. Location is super convenient, furniture was comfortable and the sunsets/sunrises are a real highlight. 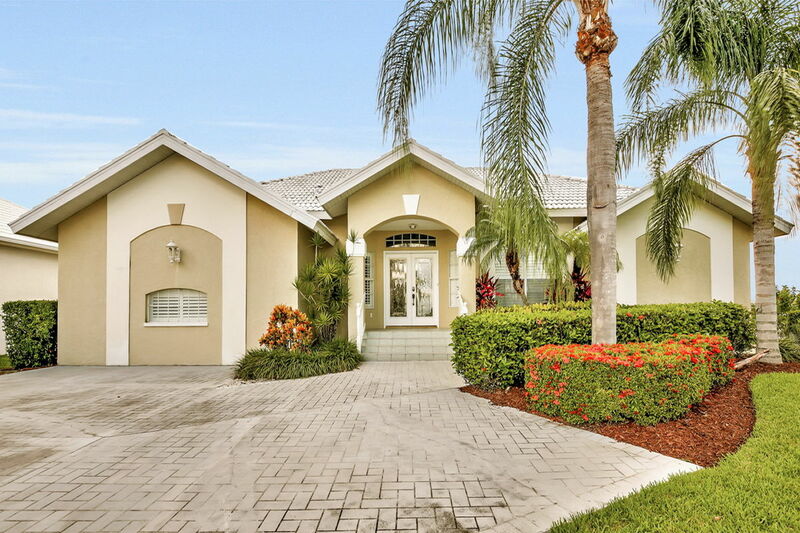 Very well-kept property without any bad surprises. Definitely coming back here, no need to experiment elsewhere on the island. 10/10 with that rare Tiki Bar! My family and I had an awesome time at this property. The house was beautiful and well equipped. 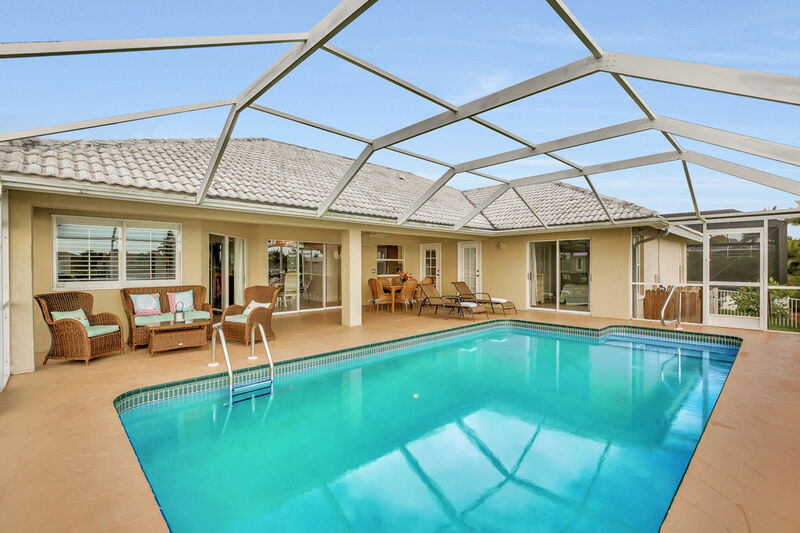 We especially loved the lanai area with the heated pool. We ate every meal, played games and just relaxed at the outdoor dining table. We only had one day that was kind of windy and cool, but the other 5 days were spent lounging in the pool, soaking up the warmth from the sun. The tiki bar hut on the dock was incredible also. We spent many mornings and evenings grilling, fishing and just watching the sun set. 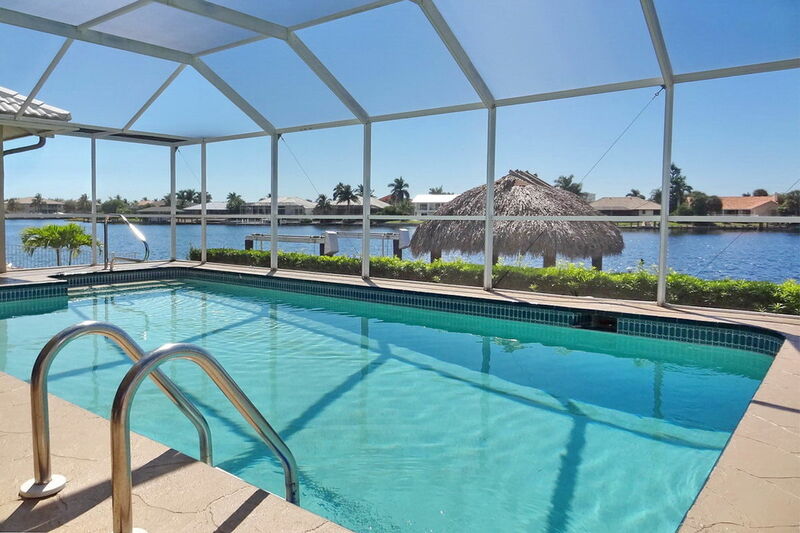 We highly recommend this property whenever your travels take you to Marco Island. This place is beautiful. The lanai/pool area was great and the best part was the Tiki Bar on the dock. We spent much time there grilling, fishing and enjoying the sunsets. The place was very clean and well stocked. We cooked most of our meals and enjoyed swimming in the pool with southern exposure, so the sun is on it all day. We ate all our meals outside at the large dining table. My family and I highly recommend this place and will definitely stay again whenever we are planning a trip to Marco Island. We had a great time. The house was in good condition with plenty of extras. It was great they had plenty of towels, beach towels, and beach accessories. There was plenty of room in the house, the pool was awesome, and the beds were great. 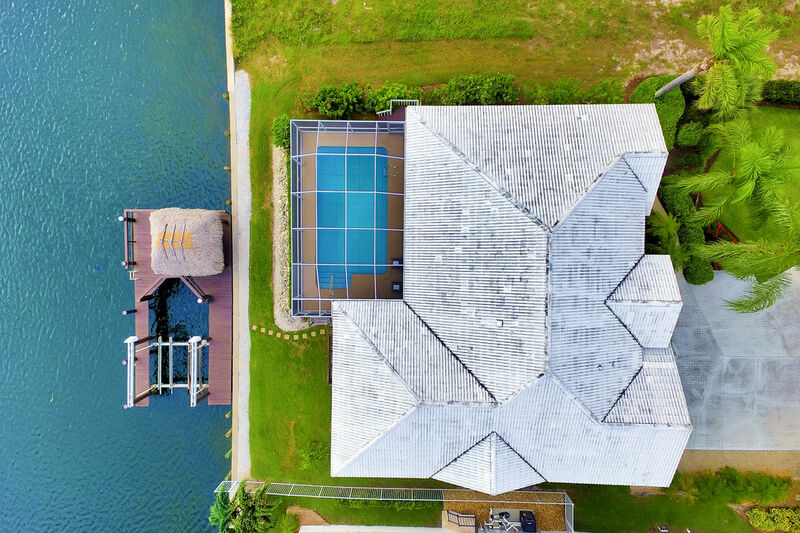 If visiting Marco Island again I would definitely stay at this house again. We loved the view from our vrbo home! The sunsets were the highlight of each day. The home is very nice and well-equipped. There were a few challenges with the Tv's but the rental company was great at responding to all our problems. 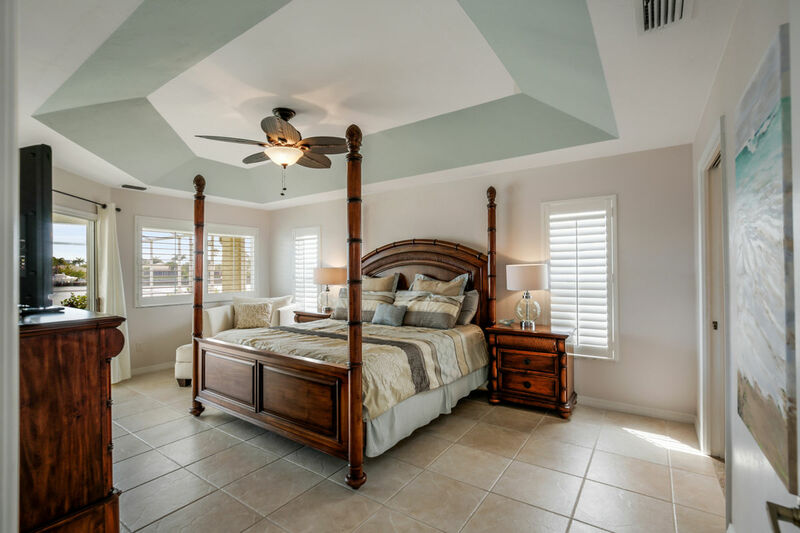 We had such a Great stay in Marco Island - The home was exactly as advertised / Beautiful ! The house was Very clean , all necessary amenities were available, kitchen well stocked with cooking needs, utensils Etc. Beach Chairs, Beach Towels, fishing rods, Bicycles Etc. 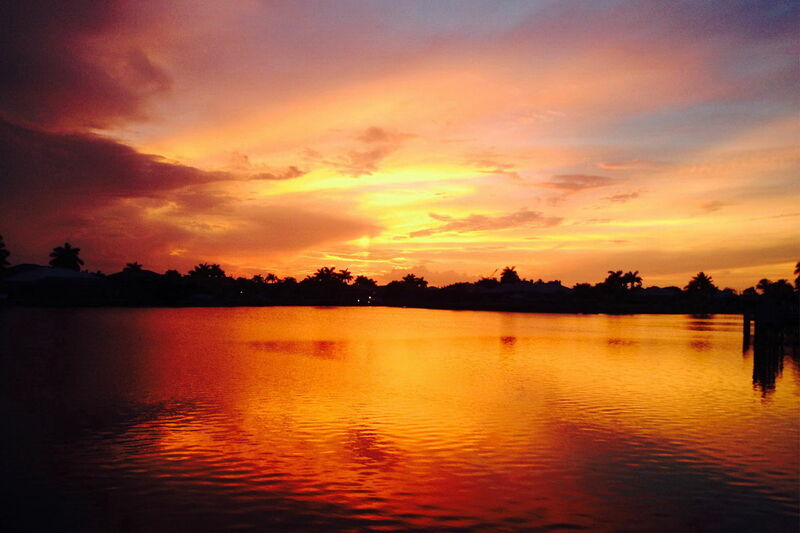 The Tiki Hut was a great place to BBQ & watch the spectacular Sunsets. Would definitely recommend a stay here..
We really enjoyed our stay!!! Thank you for everything!! One suggestion- a mirror in each bedroom would be helpful! We just spent 2 weeks in this fabulous house. We are 3 adults and a teenage girl. It was exactly as the pictures showed, but even more beautiful. 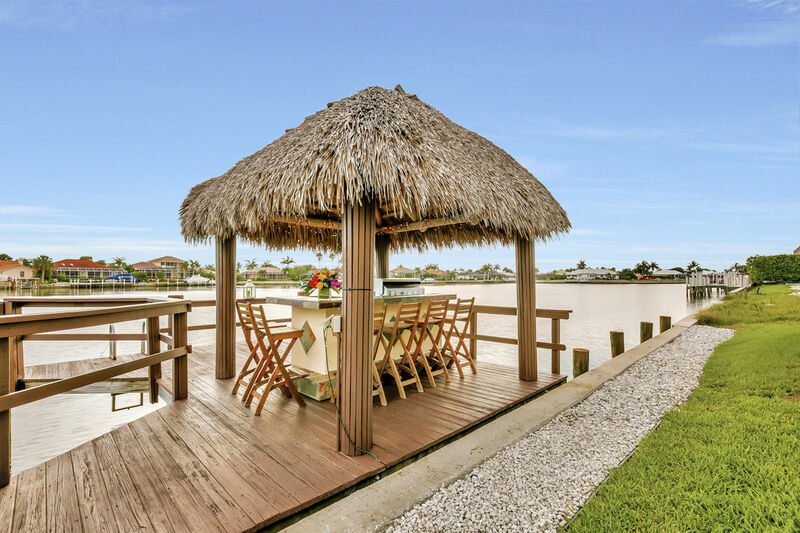 It is located in a very peaceful location, but also central to everything on Marco Island. The tiki bar was great although we would suggest that the chairs need replacing there as they are quite wobbly. 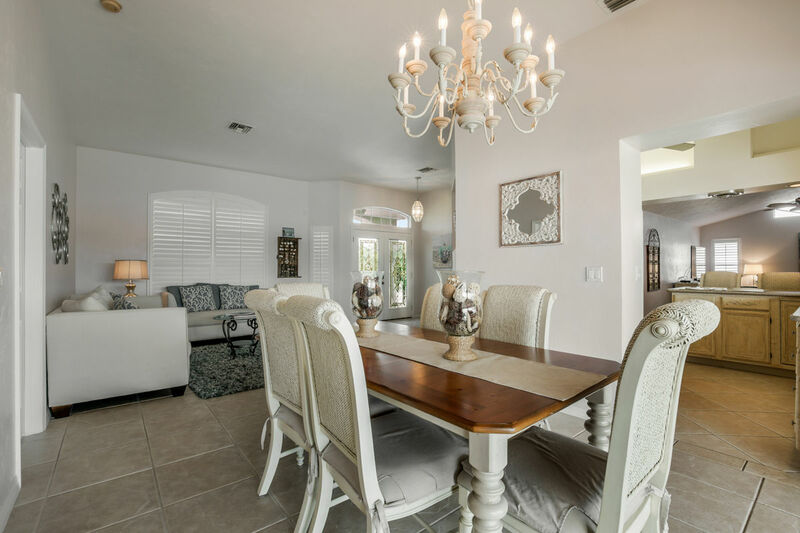 The house has everything and more that you need to make a vacation perfect. We would totally recommend this property to anyone, and we would not hesitate to rent again if we decided to go back to this area. 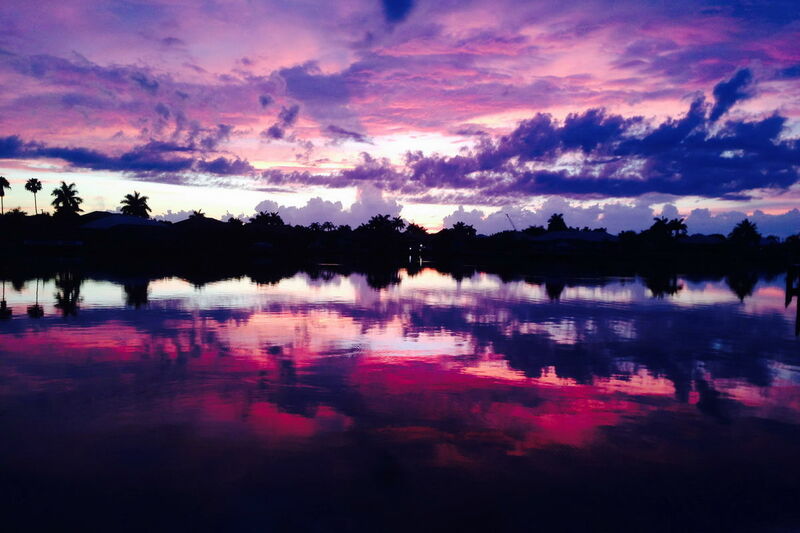 Marco Island is the perfect vacation getaway. My family loved this home! We will definitely consider this home in the future. We enjoyed our time at this house. Great for families. 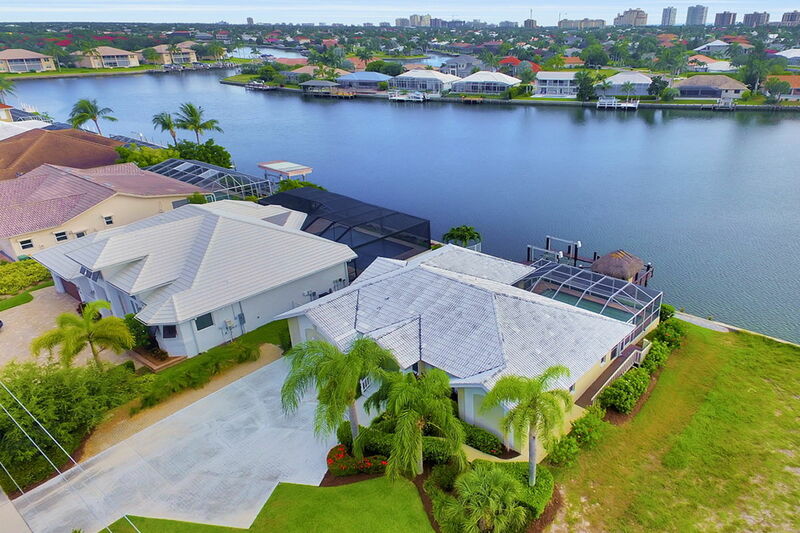 Easy access to everything Marco Island has to offer. The house was located close to everything, if you was excellent. It was nice having a place to fish off the back deck and our own pool. But it was a quick drive to any of the beaches around. We would recommend this to our friends and we would do it again.